You are invited to an awesome concert featuring the world class virtuosi of the Seattle Chamber Music Society! 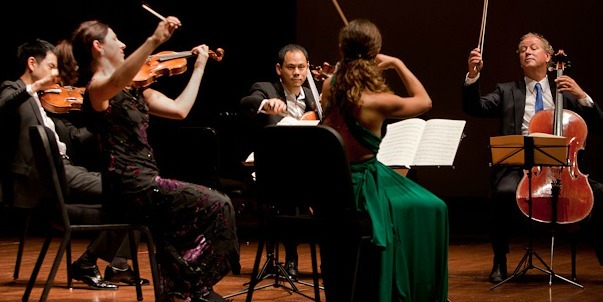 In the program: a modern masterpiece by Frank Bridge, his Phantasy for Piano Quartet featuring Stephen Rose, Cynthia Phelps, Astrid Schween, and Orion Weiss, followed by Beethoven's most famous, and arguably his most beautiful, Violin Sonata, the "Kreutzer Sonata" performed by Erin Keefe and Max Levinson. The evening closes with a stunning quartet by Edvard Grieg featuring Tessa Lark, Jun Iwasaki, Jonathan Vinocour, and Julie Albers. When you arrive at the hall please mention your LAST NAME at Will Call to retrieve your ticket(s). All tickets are for adjacent seats. See you soon!